Home » Our Products » Who Works With Cincom Smalltalk? The Cincom Smalltalk™ Partner Program is designed to develop and maintain relationships with organizations and individuals specializing in providing object-oriented solutions. Get more information about the Partner Program. ChannelStream is a comprehensive and unique tool that integrates streams coming from different document management systems and enterprise systems. This document output management system enables you to leverage your existing legacy infrastructure—without any programming. It is an easy-to-use tool that empowers business users to enhance existing documents, test and preview them, manage their output through any desired channel and track all documents across the entire output process. ChannelStream provides critical features to fulfill—and even exceed—your expectations, particularly in ever-changing markets with increasing legal regulations. Business users can thus shorten the delivery cycle and maximize the cost savings possible from using an output management system. Learn more about ChannelStream. The Georg Heeg EK Company was founded in 1987 and works exclusively with Smalltalk by providing consulting, training, development, pre-sales and post-sales support and Cincom Smalltalk product support. Georg Heeg eK was the first Smalltalk-80 distributor in Europe and they’ve been a dedicated Smalltalk shop throughout the years. Smalltalk has gone through a series of ups and downs, mergers, acquisitions and name changes. Cincom acquired ObjectStudio in 1996 and then VisualWorks in 1999, forming the Cincom Smalltalk Suite of products. It wasn’t until Cincom brought these products together that Smalltalk has seen so much growth and future growth potential. It’s partners like the Heeg organization and their dedication to Smalltalk and Cincom that has added to this growth for Cincom, Cincom Smalltalk and of course, Heeg. Georg Heeg eK officially became a partner with Cincom in 2000 shortly after Cincom acquired VisualWorks. Over the past 13 years, Heeg has built a strong and valuable relationship with Cincom by being a trusted partner through development, consulting, support and most recently, as a Value Added Reseller. Learn more about Georg Heeg EK. Since 1988, JOOPS for Information Technology has developed solutions in various fields for its customers. Since 2004, their business focus has been on the BPM-/Workflow-System OfficeTalk as a central solution for managing and optimizing business processes. The system was developed by Joop and supports companies in all industries, ranging from tax firms over facility management to production companies and property managers. OfficeTalk is used for traditional enterprise customers as an enterprise solution and IT systems companies as an OEM product. Learn more about JOOPS. Established in 1985 and located in Cary, North Carolina, KSC is the world leader in Smalltalk education and services and has employed some of the nation’s defining authorities on object technology. The bookshelves of programmers around the world reflect the contributions that KSC has made to enterprise software development. Used extensively in enterprise software development, Smalltalk is the best-supported, pure object-oriented programming language available. KSC offers a longstanding success record and a wealth of technical expertise to its clients. KSC has worked with companies in numerous industries including: insurance, banking and financial, telecommunications, warehousing and distribution logistics, healthcare and manufacturing. Knowledge Systems Corporation is a full-service provider of education, mentoring, consulting, computer repair and staffing, as well as fixed-bid software migrations and platform conversions focusing on Smalltalk to Smalltalk, Smalltalk to Java,VisualAge Generator to Websphere Enterprise Developer (VaGen to WSED), Java to Smalltalk, and 2-tier to 3-tier architecture conversion. Simberon Incorporated provides Cincom Smalltalk consulting and training services. Simberon is well versed with Cincom® ObjectStudio®, Cincom® VisualWorks® and Visual Smalltalk Enterprise. 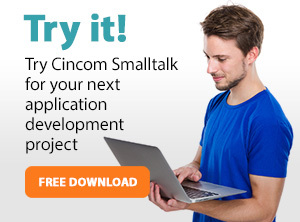 They provide assistance with applications written in Cincom Smalltalk for companies who needed training or an application evaluation to make sure that they were getting the most out of their Cincom Smalltalk solution. If you are interested in Smalltalk product training, consulting services, upgrade assistance or a product analysis, please contact Suzanne Fortman, Director – Smalltalk Global Operations.